Posted on November 19, 2012 by Susan H.
My eldest son, Michael, is eating me out of house and home…I kid you not! Trying to keep enough somewhat healthy dairy, egg, beef, sesame, fish, shellfish, peanut/tree nut, mustard and raspberry free options in the house is fast becoming my latest challenge. I am sure this is the same for any household with a growing teenager in their midst. The challenge for me comes with the fact that most of Michael’s allergy friendly ‘snacks’ need to be made from scratch or at the very least, ‘made to order’. I put ‘snacks’ in quotations as it is not necessarily a snack he is after… his ‘snacks’ seem to be taking on the appearance of what I would consider more of a meal. Examples would be…a bowl of pasta with extra virgin olive oil and ham slices on the side. I have small containers of Spaghetti Meat Sauce frozen for Michael to dethaw and serve over pasta. Daiya Cheddar Style Shreds Grilled Sandwiches are a favourite as are Schneider’s Country Naturals Barbecued Chicken Wings and Chicken Strips…not sure why they are not listed on their website. 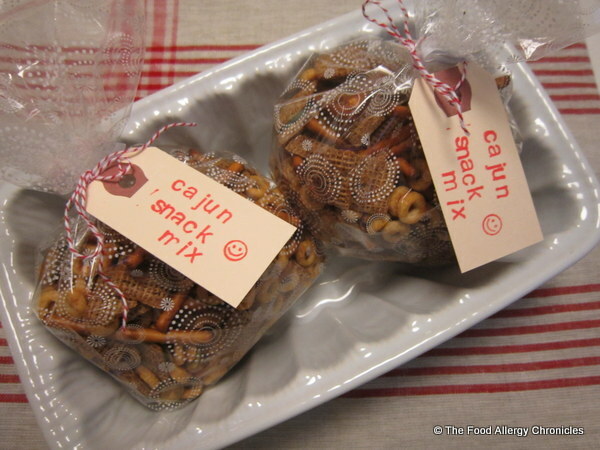 In my constant search for recipes to adapt, I stumbled upon a recipe for a Cajun Snack Mix in the Inspired Holiday 2012 magazine from my local Foodland. I thought this would be a fun, healthy snack to adapt…perfect to have on hand when Michael’s ‘munchies’ hit. Michael loved the pretzel sticks and the roasted pumpkin and squash seeds the best. He felt it could be a little less spicy so I think next time I would reduce the hot sauce to 1 tsp or just omit it altogether. I also found that the pumpkin and squash seeds did not roast as well mixed with the other ingredients…next time I would roast them separately. For this recipe, I painstakingly picked out every last seed and roasted them at 350 F until they were nicely toasted. There are not many options in the ‘snack department’ with food allergies…many ‘spice mixtures’ tend to either contain or have been cross-contaminated or are made in the same facility with dairy, peanut/tree nuts, sesame and or mustard…all of which, are Michael’s food allergens he must avoid. 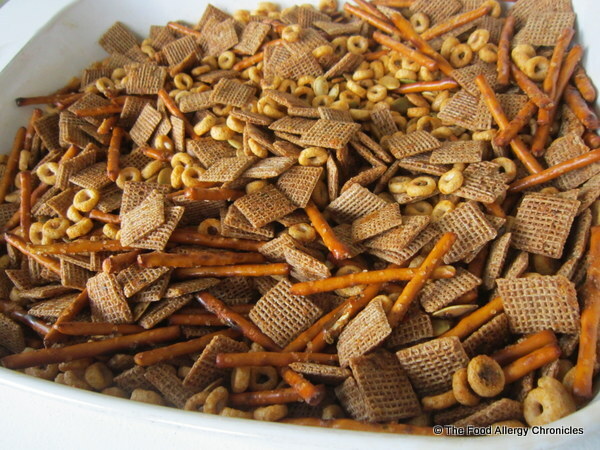 The beauty of making your own snack mix…one can adjust the seasonings accordingly. In a large, shallow roasting pan mix together the Cheerios, Shreddies, and pretzel sticks. On a separate cookie sheet, spread the pumpkin and squash seeds. In a small bowl, mix together the oil, hot sauce, Cajun and garlic powder. Pour most of the seasoning mix over the cereal mixture and some over the seeds…I used my hands to really combine everything well. Bake the cereal mixture at 325 F for 15 minutes…stirring half way through. Increase the heat to 350 F and bake the seeds stirring every 5 minutes until toasted. Add the seeds to the cereal mixture and toss to combine. P.S. The two packages of Peanut/Tree Nut, Mustard and Sesame Free Cajun Mix were presented to Carla’s girls @ My 1/2 Dozen Daily and a dear family friend who is watching his diet. P.P.S. A gluten-free version could be created with Gluten Free Rice Chex, air popped popcorn, pumpkin and squash seeds…Glutino Gluten Free Pretzel Sticks would be okay if you were not allergic to sesame as they may contain traces of sesame. Tip: Please remember to always check the ingredient lists of all products. 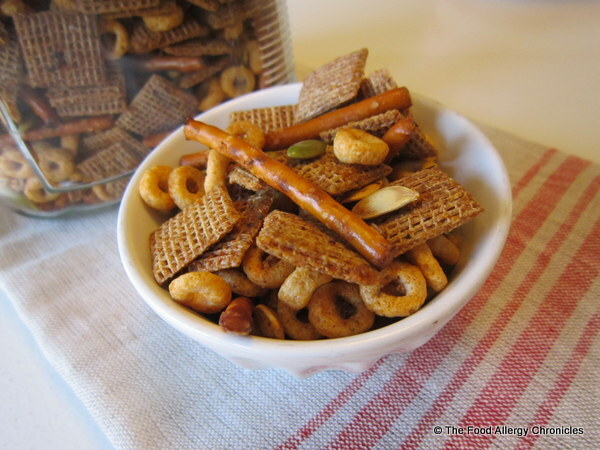 This entry was posted in dairy free, multiple food allergies, mustard free, peanut/tree nut free, sesame free, Snacks, soy free and tagged allergen friendly snack mix, Inspired Holiday 2012 Magazine, Peanut/Tree Nut Mustard Sesame Free Cajun Snack Mix by Susan H.. Bookmark the permalink.